The sinfully appealing Lord Lucien Esher, London’s most accomplished rake, believed there was no woman born who could not be seduced. But his hard-hearted facade hid a tragedy hid a tragedy that was slowly devouring him from within. Determined to save her treasured ancestral home, Madeline had no use for love. Nor would she allow an unredeemable scoundrel to distract her from her goal. Yet against her better judgment, she was drawn to the elusive and dangerous Lucien. As Madeline and Lucien began their dance of desire and denial, their passion rose to a crescendo of longing and sacrifice that would determine their fate forever. Lucien Harrow was drunk. It was not uncommon. In his set, to be sober at three of a muggy early summer morning would have been a far more unusual occurrence. What was uncommon was the fact that he sat in his shirtsleeves in his study, his brocaded waistcoat flung over the back of a chair, dipping his quill again and again in a pot of ink. He squeezed his eyes closed and pushed away from the writing table, dropping the quill and picking up his glass. His head bobbed in time to the sound in his mind, the notes undrowned. Unsteadily, he aimed himself for the sideboard and the decanter of claret. Crystal bottle in hand, he hummed the music aloud, over and over, swinging the bottle as if he were conducting. And as he hummed, he saw the notes as a river of colors. They rose and swirled, like an elaborate braid, each strand woven around the others, none muddied or muted. Unless he wished it. The claret shone in his glass, ruby colored, like the sound of viola. Lucien pushed his hair from his face and drank deeply, then stumbled back to his desk, carrying the glass. Some splashed onto his hand. A burn in his belly warned him to cease, but he drank it all in a single swallow. He then gathered the sheaf of papers over which he’d been laboring, and calmly, deliberately held them over the flame of the candle until they caught fire. When they were black and curled, he tossed them on the grate and stumbled toward bed, having silenced the sounds one more time. I alike with all can sport. A rose thorn bit Madeline’s finger, another tiny, stinging scratch to add to the many marks covering her hands. Absently, she straightened. Sucking welling drips of blood from her finger, she eyed a cloud of dust that marked the arrival of yet another pair of visitors. Their figures were haloed against the lowering gold light of a late May afternoon. Guests had been trailing in most of the day in a slow, sporadic trail, Londonites fleeing the strange early heat of the city. Among them would be the marquess Beauchamp. Madeline wondered if one of these might be he, the man who would, with any luck, be her husband before the year was through. As this pair, one on a horse, the other a phaeton, raced through dusty bars of sunlight on the drive, Madeline doubted seriously either of them was the marquess. She’d heard he was a conservative man. Since it was the marquess she awaited, Madeline turned away. Overly warm and feeling dusty, she knew she ought to go inside and bathe before supper, but a curious stubbornness kept her wandering through the ragged hedges and neglected flower beds, pausing to peer at one bush or another with a frown. Once the gardens at Whitethorn had been famous throughout England, the legacy of the first earl of Whitethorn. Madeline had often thought the man was her spiritual grandfather, for she alone among his descendants had been born with his passion for the place. Juliette, her stepmother, was in favor of allowing it to go wild in the fashion of the day, but Madeline couldn’t bear the thought. Unfortunately, there was simply not enough money left in the estate to pay the gardeners required to maintain formal gardens of this size. And not even Madeline, with her love and the knowledge she’d laboriously uncovered for herself, could hope to do it alone. With a sigh, she shook her skirts and wound her way toward the house over a path covered with lemon thyme. The sound of the two riders pounding up the graveled drive reached her. She brushed away a stray lock of hair as she looked through the clairevoie, a window cut in the eight-foot-high topiary hedge. The riders raced up the road madly. The gleaming, sporty phaeton rocked dangerously in the rain-rutted course. The other man rode on a beautiful, lean black horse; beast and man were illuminated with the bars of hazy light falling through thick tree branches. They were young men, London rakes, a breed of man beneath Madeline’s contempt. She found their arrogance and idleness a bore. And yet, as they laughed and shouted, each goading the other to a faster pace, Madeline felt her blood rise in a strange excitement. It was in particular the man on the horse who caught her eye. He wore no powder or wig, and his thick dark hair was drawn back into a queue with a black ribbon. His body was long and sinuously made, and he rode as if he and the horse were one being. From where she stood, his face gave the impression of exotic tilts and powerful bones. But it was the hedonism Madeline ordinarily found so distasteful in such men that drew her now, made her take up her skirts and run toward the opening of the maze so she would not lose sight of him behind the hedge. She broke through to the open stretch of lawn between the maze and the Elizabethan house of Whitethorn just as the man urged his horse into a full run. Light dappled faster and faster over his dark hair, his dark horse, his long legs. Next to him, only a little behind, the phaeton rocked noisily. As they neared the end of the drive, Madeline burst into a run. The man on the horse left the road and bolted across the same lawn. His speed was almost dizzying, and he headed with purpose for a shoulder-high hedge that edged the house garden. Madeline froze. They would both be killed. But even as she clamped a hand over her mouth, watching in horror, the black beast leaped with stunning grace over the squared hedge. Horse and man hung—haloed and gilded by the afternoon light—for an endless time against the sky. As he hung there, suspended in midair, looking like Pan, like some untamed beast come in from the wild, the man laughed. The sound rang with robust defiance into the day, and Madeline felt her heart catch with a sharp pang. Horse and rider landed nimbly on the other side of the hedge. For one long moment, Madeline stared after him, her heart pounding. Then, setting her mouth, she gathered her skirts and turned away to slip into the house by a side door. She didn’t wish to greet anyone in such spirits, and particularly not the man who’d risked life and limb for a foolish jump. The sound of the free male laughter, the easy camaraderie of bets won and lost, followed her as she ducked into the house. Lucien Harrow dismounted with a victorious cry. Lucien leaped up the steps and took her hand, his breath still coming fast. The widowed countess, though well past the first blush of beauty, was still generally counted to be the most glorious creature London had ever seen—and word was her sexual appetites were as prodigious as her beauty. Lucien had never been her lover, but he never ruled out the possibility. With a mocking smile of his own, he lifted her hand to his lips and pressed a bold, moist kiss to it. Jonathan elbowed Lucien aside, not at all covertly, and swept the countess into a lewd embrace. Over his head, Juliette met Lucien’s eyes with a tiny smile, lifting one eyebrow lightly. Jonathan, recovering, laughed. “Hardly.” As if all was forgotten, he gestured for both to go inside. But both of them knew Jonathan had revealed too much. Lucien smiled to himself, plucking a rose from the bush alongside the door. Jonathan in love—fancy that. And with the most notoriously unfaithful woman in all of England. Interesting indeed. Lucien doubted he’d try to seduce her himself; for all her beauty she was a female of surprisingly sharp edges. He fancied women a little softer. Nonetheless, there was nothing like a good tangle of amour and vice to brighten the dull countryside. Perhaps his exile would not be so deadly boring as he’d feared. Juliette sailed into Madeline’s chambers just before eight, dressed in a gown of apricot silk that displayed her awe-inspiring bosom and flawless skin to perfection. Pearls gleamed around her long neck, and coquettish curls framed a perfectly shaped ear. It was impossible to feel any sense of beauty in the presence of the countess, and Madeline had long ago ceased to try. Even her youth was no benefit where Juliette was concerned—every single detail of the woman was exactly what it should be to draw the attention of men. Her teeth, her eyes, her hair; her magnificent figure and modulated voice. The maids finished with her, and Madeline waved them away to don her long gloves, which would effectively hide the scratches on her hands. “Is he here?” she asked, not looking at Juliette. Madeline took her fan from the dressing table and flicked it open in an expert, mocking imitation of Juliette. “I’ll try,” she said. Madeline inclined her head and let her stepmother go down ahead of her. Before her trip to the Continent, Madeline had oft been used as a foil for Juliette’s jeweled loveliness. Tonight, perhaps the aim was to display Madeline in a better light. 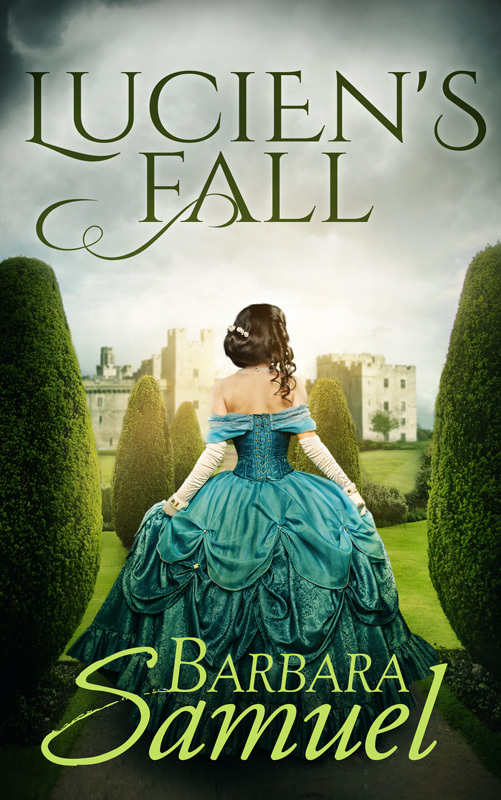 Certainly no expense had been spared on the dress, made of brocaded forest green velvet, cut in a wide square at the bodice—or what there was of a bodice. The color agreed with Madeline’s pale skin and dark hair, and the necklace of emeralds, so cold at first, had warmed and now lay with a comforting, glowing weight against her chest. The fabric and jewels made her feel a little less the dull child. Cynically, she supposed if she were to wed a marquess, she’d get used to such things. All the same, she paused for an instant outside the door to the salon. From within came the chuckling of bawdy jokes, a lascivious undertone to the notes of the string quartet playing in the corner. She clutched her hands together, wishing for the veiling of a gauze fichu to cover her bosom. She wanted nothing to do with this sort of a life, filled with parties and meaningless dinners and too much drink. But she had not, and for all her resentment of Juliette’s pushing, Madeline knew the estate needed a new source of cash. For the gardens, for the house that was her legacy, Madeline could marry as Juliette wished. Touching the armoring weight of emeralds at her breast, she took a breath and pushed open the door. A little ripple of halted, then hastily resumed, conversation flew around the room. For a moment, Madeline paused, allowing them to admire her as she’d been instructed, then cast her gaze around. There were a number of dazzling, beautiful women in the room, women Madeline had met in London with her stepmother. They stood in little groups with men in embroidered and brocaded coats and satin breeches in colors of her spring garden—new leaf green and lilac and sky blue—and red-heeled shoes. Madeline greeted them graciously. She answered their polite inquiries, smiled and allowed kisses to be brushed over her cheek. The men bent over her hand, letting their eyes linger over the body that had been so thin when she left two years before. They commented upon how well she’d grown up. She turned, bracing herself as well as she might for the sight of her husband-to-be. Instead, she saw Juliette standing with the two men from the race this afternoon. The one from the phaeton was pale and very thin, quite perfectly elegant in his presentation. The way he hung close to Juliette, Madeline thought he must be Juliette’s current lover. Thinking of the strange longing the other man had aroused in her, Madeline folded her hands before she allowed herself to look at him, and took a breath to steel herself against his heady aura of freedom. She looked up—and found his gaze boldly upon her. A jolt of—something—passed through her stomach, hard and bright, then gone. He still scorned wig or powder, and his hair seemed as violently alive in the candlelight as it had in the gold dappling of sunshine this afternoon. It was caught back from his face again in a queue neatly tied with a black ribbon, and rippled halfway down his back, thick and wavy and glossy. Now she could see the details of the handsome face: high cheekbones touched with a flush of color, an aggressive and hawkish nose, a mobile and sensual mouth. It was his eyes that gave him an exotic cast— very dark blue and slightly tilted. Like a large cat. And like a cat, the smile he gave her was both predatory and elegant. Madeline had long been acquainted with the habits of rakes. At fourteen, this sort of insolent and knowing smile had turned her knees to mush. At twenty, she was beyond melting under the gaze of any man— even one who was, she had to admit, quite compelling. Still, she did not blush or hastily look away, but affected boredom as she approached the knot of them. Madeline glanced at Juliette, surprised to hear such bold warning. The countess had already fixed her gaze rather brilliantly upon Lord Esher, who took Madeline’s hand with a startlingly strong grip. He stepped close, so close that the crown of that thick, living hair brushed the tops of her breasts when he bent over her hand. His voice was as rich as the breath of a cello, and it was oddly alluring to have him so close, to see from a few inches the depth of those eyes, to smell the dusky fragrance of his skin. He held her hand and her gaze for a beat longer than was proper, a tiny smile playing at the edges of his sensual mouth. “Madeline, how rude of you!” Juliette said, amused. Lord Esher laughed. “What a wise daughter you’ve raised, Countess,” he said. His gaze never strayed from Madeline’s face, and she found the steadfast perusal unsettling. “Stepdaughter,” Juliette said, and spatted him with her fan. Madeline looked toward the long windows showing the setting sun framed by damask drapes, amused in spite of herself. Juliette, who was the daughter of a dressmaker, did not like being teased about her humble beginnings. Lord Esher evidently knew it. Madeline glanced at him from the corner of her eye. Boldly, he admired Madeline’s figure, making no pretense of doing anything else. The nearly violent blue of his eyes touched her shoulders and breasts and waist with approval. Madeline inclined her head in return, just as mockingly, a smile on her lips for the first time. If he did not exert himself too much—and why would he— she’d grow used to his extraordinary appeal very quickly. It was only the suddenness of his appearance that made her feel so unsettled. She’d had crushes on far more magnetic rakes than this. A stirring at the front of the salon caught her attention. Madeline turned, hoping it would be the marquess. A man came through the door, nodding distractedly at the guests. Madeline stared for a long moment. He was not the piggish creature she’d feared, nor was he at all handsome. Too plump, too soft. His clothes were a bit askew, as if he’d hurried or been careless, and his forehead already showed two half-moons of skin where his hair was falling out. Behind her, Madeline felt the presence of Lord Esher. His voice fell in her ear. “I hope you won’t mind one single compliment, earnestly extended.” The warmth of his breath brushed her earlobe. Madeline stared at the marquess, knowing her life hung in this moment. As she waited, the marquess caught sight of her, and the round, unremarkable face was transformed by a smile of deep and singular sweetness. He gave her a small, courtly bow. For an instant longer, Madeline hung back. All her dreams of romance, of love, were swept away. She might one day grow fond of this round little man, but she would never love him. A tiny shudder rippled over her arms. “Yes,” she said with more certainty than she felt, and moved forward. She smiled at the marquess as graciously as she was able, feeling a cool brush of air replace the breath of Lord Esher against her neck. She did not allow herself to look back.